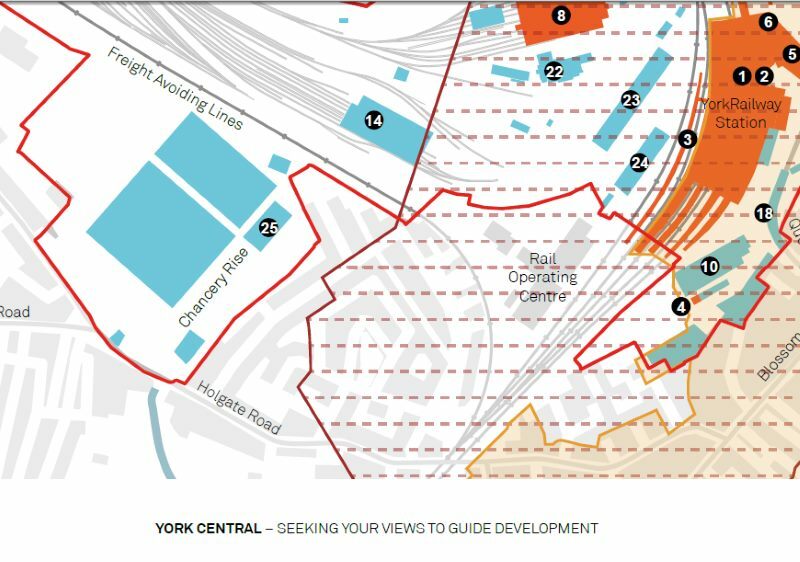 I’m sure we’re all eagerly awaiting the carefully collated results of the York Central consultation, which, the consultation information pictured above told us, was ‘SEEKING YOUR VIEWS TO GUIDE DEVELOPMENT’. On that image above, number 25 is a building called Alliance House. I don’t have any photos of it, but I want to use Alliance House to make a couple of points, which tie in to themes we’re perhaps familiar with on these pages. Wasn’t it nice to read that the local authority and its partners really wanted to hear from residents on the York Central plans. It was almost convincing in some ways, this apparently genuine interest in the views of citizens ‘guiding development’. Rather suprising then that at the same time as the consultation opened, Network Rail had submitted a planning application to demolish one of the buildings we were apparently being asked about. The application to demolish it was submitted on 25 Jan and validated by City of York Council on 11 Feb. The ‘consultation’ opened on 18 Jan and closed on 18 Feb (extended from the original deadline of 15 Feb). I’ve already written about how alienating and annoying it was to see that the remaining carriageworks buildings and in particular the canteen building weren’t included in the numbered list/key of important buildings. Alliance House, the other remnant of the carriageworks site, did get a number and a mention in the list. But Network Rail were at the same time putting the paperwork through to demolish it, an application validated by City of York Council, who were simultaneously trying to convince citizens that this was a proper consultation about the York Central site and that our views were really important. Local authorities make a big thing about consultation. It’s all got to look right, and give us the illusion that we’re valued citizens and not just people paying council tax to prop it all up. If there is a consultation many of us feel like we really should make the effort to engage, while simultaneously knowing that the powers that be really don’t care much because most of it has already been decided. So here we are, with Alliance House illustrating that. Network Rail, who submitted the application, and City of York Council, who received it, are partners in the York Central scheme. So it’s all sewn up already really isn’t it, and so much so that I don’t know why they bothered to put number 25 on their heritage plan. It also needs to be said that this place called Alliance House has no personal meaning to me, and that my concern is the buildings nearby, and the way that the imminent demolition of this one has been handled. Caring about heritage isn’t about wanting to preserve every old building just because it’s old. Some buildings, while they stand, stand for something bigger, for a shared knowing and memory, remind us of family, or the culture of a time and place. So the carriageworks canteen building stands for that, because it was part of the entrance to the carriageworks. For me, Alliance House doesn’t have any associations, except that it was part of the carriageworks site. But so much of that has been cleared already. the Panel is concerned at the gradual nibbling away of buildings on the site, without any overall plan having been prepared, and feel this should be done prior to any further demolition. The application is still open for comment (ref: 16/00175/DMNOT), so if you’d like to raise any of the points made above, or indeed any other points, I hope you’ll feel it’s worthwhile to do so. But if you can’t be bothered and have better things to do with your time, fair enough, so do I. As long as we’re all aware that heritage isn’t just about pretty stuff, and that ‘consultation’ is so often just something to make local authorities look like they’re doing the right thing, while it seems that things are decided just as they always were.